Large-Scale Projects In Small Diameters Win GSTT Award 2015. Two projects in which microtunnelling machines from Herrenknecht are driving new sewers have been awarded the "GSTT Award 2015" by the German Society for Trenchless Technology e.V. (GSTT). The special award "International Project" was given to the National Water Company of Saudi Arabia. At their unusual construction site in Mecca two Herrenknecht EPB shields with an individual remote monitoring system are in use. The Emschergenossenschaft received the GSTT Award “Gold” for a construction of a section between Dortmund and Bottrop as a part of the Emscher renaturation. Since 2013 several Herrenknecht utility machines have been driving a new sewer system there. As the owner of the "Makkah Haram Sewer Line" project the National Water Company of Saudi Arabia was honored with the GSTT Award in the special category "International Project". Directly under Mecca, the most important place of pilgrimage for Muslims, two Herrenknecht EPB Shields (Ø 3,510 mm) are driving much needed sewers with segmental lining. Tight curve radii of 80 meters are being driven over distances of 1.5 and 1.8 kilometers. For the particularly secure removal of sewage through holy groundwater, concrete segments with two sealing profiles and an HDPE inliner provide additional protection. Herrenknecht produced the tunnel boring machines for this project and put together a tailor-made service package: Because only Muslims are allowed to enter the city of Mecca, together with the construction company Saudi Binladin Group Saudi Arabia a special remote monitoring system customized for the project was developed. Machine operators from Herrenknecht can support the advance around the clock. Therefore the tunnel boring machine's control cabin was duplicated and its data transmitted from the jobsite in Mecca directly to the offices in Schwanau. In addition, prior to tunnellling, at the Herrenknecht plant in Schwanau the customer's site crew were trained on the machines set up in the curve radius. "We have to work under time pressure in tight curve radii under Mecca’s busiest ring road and through holy groundwater. For this unique challenge we needed a unique solution. Herrenknecht gave us a complete package - including 24/7 support” says Eng. Ibrahim Balaban, General Manager of the Tunnelling Division in the Saudi Binladin Group Saudi Arabia. The GSTT Award in "Gold" was awarded to the Emschergenossenschaft Water Management Society. As the project owner of the Emscher renaturation it was honored for the planning and construction of the 35 kilometer long section BA 30 between Dortmund and Bottrop. The construction company Wayss & Freytag Ingenieurbau AG is driving more than 25 kilometers of the sewer sections with an EPB Shield and five AVN machines from Herrenknecht. At this large-scale project, the renaturation of the Emscher, a variety of tunnelling machines from Herrenknecht have been in use for about 20 years. At the construction sections 20 and 40, the construction company PORR GmbH is excavating about 23 kilometers of sewage tunnels with three EPB shields. Ulrich Schaffhauser, Deputy Member of the Board of Management and Director Utility Tunnelling at Herrenknecht, congratulated the winners. "We congratulate our customers on the honoring of their unique construction projects with this year's GSTT Award. We are delighted to provide Herrenknecht know-how to support these important trenchless microtunnelling projects that make a contribution to improving the quality of life and conserving natural resources." The German Society for Trenchless Technology e.V. (GSTT) confers winner awards in “Gold”, “Silver” and Bronze for current trenchless construction projects. An extraordinary and spectacular international project receives a special "International" award. 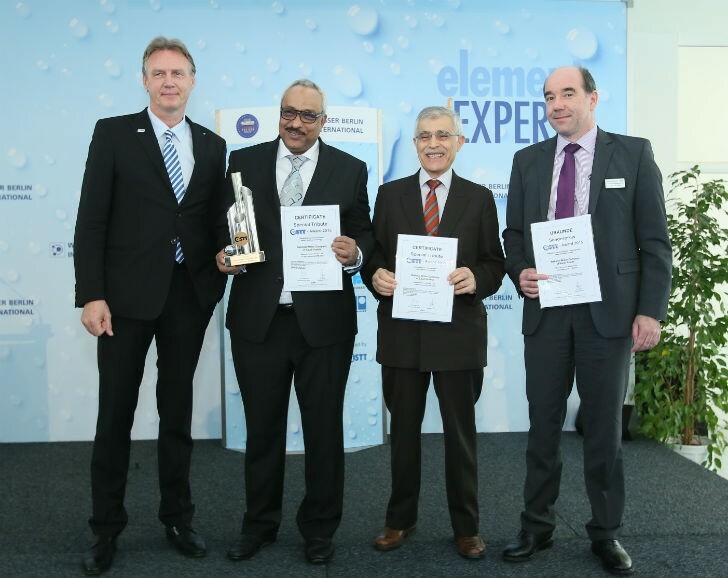 The award ceremony took place on March 24, 2015 at the official opening ceremony of the exhibition "Wasser Berlin International" (International Trade Fair and Congress for Water and Wastewater) in Berlin. Two EPB machines (Ø 3,510 mm) are driving 1.5 and 1.8 km long sewers in tight curve radii of 80 meters under the city of Mecca. The tunnel boring machine's entire control cabin was duplicated and its data transmitted from the jobsite in Mecca directly to the offices in Schwanau. This means machine operators from Herrenknecht can support the advance around the clock. The Herrenknecht AVN machine M-1728 being lifted into a launch shaft. Excavation of Turkey's longest water tunnel came to an end on December 18, 2018. To get there, a 5.56 m (18.2 ft) diameter Robbins Crossover (XRE) TBM and the contractor JV of Kolin/Limak had to overcome dozens of major fault zones and water pressures up to 26 bar. The completed national priority water line is set to go into operation in March 2019. On October 4, 2018, onlookers watched as a 3.8 m (12.5 ft) diameter Robbins Main Beam TBM completed its epic journey. The TBM, christened "Driller Mike", after local rapper and activist "Killer Mike", overcame extremely hard rock conditions along a curving 8.0 km (5.0 mi) tunnel to bolster the city of Atlanta, Georgia, USA's water supply. On August 29, 2018, a 9.26 m (30.4 ft) diameter Robbins Crossover (XRE) TBM crossed the finish line at the Akron Ohio Canal Interceptor Tunnel (OCIT). A press day followed on September 5, where companies and members of the media were invited to view the giant machine. The machine — dubbed "Rosie" in honor of Rosie the Riveter, an icon representing American women who worked in factories and shipyards during World War II — overcame tough ground conditions during the bore. Nepal's first tunnel boring machine, a 5.06 m (16.6 ft) diameter Robbins Double Shield, is living up to the nation's high expectations. The TBM, supplied in summer 2017 for the Bheri Babai Diversion Multipurpose Project (BBDMP), recently bored over 1,000 m (3,280 feet) in one month and has been averaging an impressive 800 m (2,630 feet) per month. The project is owned by the Government of Nepal's Department of Irrigation (DOI) and operated by contractor China Overseas Engineering Group Co. Ltd. Nepal Branch (COVEC Nepal). In Chicago, Illinois, USA Kenny Construction is nearing completion on the Albany Park Stormwater Diversion Tunnel. The project, owned by the Chicago Department of Transportation, will divert water from the Albany Park neighborhood, which has long been plagued by flooding. Plans for the tunnel began in 2013, after flood conditions became so severe that residents had to be evacuated from the area by boat. The tunnel is expected to be functional by April 2018. Whether it's a world record with the longest railway tunnel on earth at the Brenner or the epoch-making Gotthard project, the business of mechanized tunnel boring through hard rock is currently reaching new heights in Europe. Now Scandinavia is discovering the advantages of mechanized tunnelling. With the breakthrough at the Ulriken Tunnel, the first major tunnel project in Norway using a Herrenknecht Gripper TBM has been successfully completed. With the breakthrough of the last two tunnel boring machines into the target pit in Oberhausen-Biefang on June 12, 2017 the tunnel and pipe jacking work for the Emscher sewer has been completed. Over a period of 25 years numerous Herrenknecht tunnelling machines and a wide range of additional equipment were successfully used in the Europe-wide unique environmental and sewage project of Emschergenossenschaft. Los Angeles is a vibrant center of international film art and innovation - not just on the surface. The area below ground is the scene of state-of-the-art engineering achievements. German high-tech machines from Herrenknecht are creating underground arteries for the American city. Tunnel boring machine (TBM) , Harriet successfully completed her drive for the Crenshaw/LAX Transit Project in April 2017. Angeli just finished digging the first of two tunnels for the Regional Connector Transit Corridor on July 18th. From spring 2018 onward the tunnel boring stars will have additional company: for each of the "Purple Line Extension Sections 1 + 2", two more Herrenknecht TBMs will be working their way through the difficult ground. All three projects are part of the strategic subway extension in L.A. to relieve the traffic above ground. A Robbins TBM, recently christened “Augustine”, is being commissioned to undertake its eighth bore after being launched by contractor Eiffage Civil Engineering on March 3. The TBM, which was extensively modernized and upgraded during the rebuild for the Galerie des Janots project in La Ciotat, France, has previously completed seven other successful projects across Europe and Hong Kong. This time, it will bore the Janots gallery to improve access to water in the communities east of the Aix-Marseille-Provence metropolis (Cassis, Roquefort-la-Bédoule, La Ciotat and Ceyreste). "It’s a single machine 3.5 meters (11.5 ft) in diameter, 250 metric tons (275 US tons), and 135 meters (443 ft) long, that will work 24 hours a day for almost 10 months during this operation,” says Marc Dhiersat, Project Director of Galerie des Janots for Eiffage. McLaughlin introduced the groundbreaking Steerable Rock System (SRS) at the CONEXPO/CON-AGG 2017 trade show. The SRS is the auger boring market’s first steerable head designed to navigate not only solid rock but difficult fractured rock conditions as well. Engineered to operate in rock up to 25,000 psi, the SRS allows operators to maneuver auger boring machines even in the toughest ground conditions for an on-grade bore. Chile’s Los Condores HEPP is a high cover, hard rock challenge, with 500 m (1,640 ft) of rock above the tunnel and a high-altitude jobsite 2,500 m (8,200 ft) above sea level. As of January 2017, a 4.56 m (15.0 ft) Robbins Double Shield TBM had completed boring its 900 m (2,950 ft) long access tunnel and was well on the way to boring the first section of headrace tunnel. The machine embarked on its journey on May 27, 2016, and has since excavated over 1,300 m (4,270 ft) of tunnel in total. To achieve guided boring steel casing installations in deep, densely compacted ground and soft rock, Akkerman announces the newest solution in the Guided Boring Machine (GBM) equipment line, the Guide Rod Swivel (GRS-50) family of cutter heads with a universal bearing swivel. The robust GRS-50 family contains four sizes of high thrust bearing upsizing tools able to withstand up to fifty tons of continuous thrust loads on guided boring, guided auger boring, and soft rock pilot tube projects. After an Onsite First Time Assembly (OFTA) lasting just 2.5 months, Atlanta Georgia, USA’s newest TBM, dubbed “Driller Mike”, made its initial startup on October 13, 2016 and ramped up to full production two weeks later. Atlanta’s Mayor Kasim Reed and city officials gathered with local and national media to celebrate the occasion. The 3.8 m (12.5 ft) diameter Robbins Main Beam TBM is now boring the 8.0 km (5.0 mi) Bellwood Tunnel after being walked forward 100 ft into a starter tunnel. The Bellwood Tunnel path will travel from an inactive quarry and run below a water treatment plant and reservoir before ending next to the Chattahoochee River. On Tuesday, September 6, 2016, one of the longest-running Robbins TBMs embarked on its most extensive project yet. The 6.2 m (20.2 ft) Main Beam machine, owned by the Shea-Kiewit (S-K) JV, is boring the 8.5 km (5.3 mi) long White River Tunnel as the first in the next phase of the DigIndy wastewater tunnels below Indianapolis, Indiana, USA. In addition to that work, the machine will bore the Lower Pogues Run, Fall Creek, and Pleasant Run Tunnels—a scope of work totaling about 28 km (17 mi) through limestone and dolomite rock. On June 8, 2016, one of two 6.4 m (21.0 ft) diameter mixed-face EPB machines broke through at Namma Metro. After being launched in March 2015, the TBM named Kaveri made its way through its difficult 750 meter (2,460 ft.) drive from Chickpet to Majestic. Sister machine Krishna, launched in December 2015 is not far behind, and is expected to break through in approximately two months. Divers must constantly keep track of their depth and dive time in order to prevent decompression sickness, otherwise known as the bends. Because divers are breathing air while they are pressurized by the surrounding water, the diver’s tissues absorb gases (mostly nitrogen) from the breathing air. The deeper the diver goes and the longer he stays there, the more gas his body absorbs. When the diver returns to the surface and the pressure is relieved, these accumulated gases start to leave the body. If the pressure is relieved too quickly, bubbles can form. These bubbles in the diver’s tissues are the cause of decompression sickness. Nitrogen bubbles can cause joint pain and in extreme cases, impaired brain, spinal cord and lungs function. Most tunnelling contractors don’t have to worry about planes landing on the ground above them. But that – and much more – made a recent sewer-twinning project carried out by Oakville, Ontario-based CRS Tunnelling much different from your average construction job. It’s not often that a company can lay claim to two major accomplishments within the space of just a few months but that is what happened last summer with two significant microtunnelling projects completed in Calgary and Toronto by Ward & Burke Microtunnelling Ltd. The recent construction of a major trunk sewer line in Edmonton to accommodate new development is significant for a number of reasons, most significantly that it is the first time a Chinese company has done tunnelling work in North America. Topcon Positioning Group announces the launch of Topcon Delta, its new deformation monitoring solution for construction, tunneling and mining. Topcon Delta is a system of software and hardware components, which delivers accurate and reliable monitoring measurements and associated reporting to provide protection of assets during works. In a large November 2015 ceremony attended by the mayor of Montreal,, and representatives from local media outlets, the Rosemont Reservoir tunnel construction came to a close. The long-awaited project, more than 38 years in the making, gave cause for celebration as crew members crowded around the cutterhead of the 3.0 m (9.8 ft) diameter Double Shield TBM that had emerged into an exit shaft. Officials announced on November 27 that tunnelling has completed on the Evergreen Line, a new addition to Metro Vancouver's light rail system known as SkyTrain. A crowd of crew members gathered to celebrate in front of a newly-emerged hard rock TBM on December 10 in northern Norway, but their celebration was about more than just a breakthrough. The 7.2 m (23.6 ft) diameter Robbins Main Beam machine had traversed hard rock, water inflows, and more to become the first TBM used in the country since over 20 years. In Bend, Oregon, local contractor Stadeli Boring & Tunneling had a unique set of circumstances for a new gravity sewer interceptor. “We had a contract with general contractor Taylor NW to furnish and install 323 feet (98 m) of 36-inch (900 mm) steel casing under railroad tracks. Line and grade were very crucial, and the tolerances were very close. We had to be right on,” said Larry Stadeli, president and owner of Stadeli Boring & Tunneling. In addition to those parameters, the job was also in solid rock. The Bosphorus road tunnel project which broke through in August in Istanbul, Turkey is a major achievement on one of the world’s biggest and most challenging tunnel drives. At 13.66 metres diameter and 11 bar of water pressure in fractured rock and soft ground, the 3.34-kilometre-long bore was unprecedented and required skillful engineering and advanced TBM technology. How much power does it take to run a city? In a major urban centre like Toronto, it turns out, quite a lot. With a metropolitan-area population that recently cracked six million, Canada’s largest city is facing ever-increasing demands for base and peak loading. That is the case especially in the downtown core, where dense residential and commercial development has stretched power resources to the point where the need to relieve capacity constraints necessitated an additional transformer station in Toronto’s crowded south core central business district. Kuala Lumpur's karst soil riddled with fissures and crevices is a real challenge for tunnel builders. Herrenknecht, developed for Klang Valley MRT Project in Malaysia´s capital in collaboration with MMC-Gamuda Joint Venture a new type of machine. The Variable Density tunnel boring machine can be operated in four different tunnelling modes and thus perfectly adapted to the different conditions. After nearly two years of tunnelling, in mid-April 9.5 kilometers of tunnel were completed and the new technology had proven itself. A major breakthrough for Kuala Lumpur’s Metro and for mechanized tunnelling in difficult soft ground. Tunnelling for the new Port Mann water main deep below the Fraser River is now complete, and the massive tunnel boring machine, named Squirrel, was removed from the river on July 17. Robbins announced its Crossover Series of TBMs, a line of field-tested, rugged Dual Mode-type machines. Crossover TBMs feature aspects of two TBM types, and are ideal for mixed ground conditions that might otherwise require multiple tunnelling machines. The XRE (standing for Crossover Rock /EPB) is the most common type of hybrid machine, and features characteristics of Single Shield Hard Rock machines and EPBs for efficient excavation in mixed soils with rock. Akkerman has introduce the 5200 Pump Unit, the most essential element of the Tunnel Boring System. This flagship product has been improved in several essential areas while retaining the best qualities of its predecessors, to achieve optimal pipe jacking performance. Las Vegas, the glittering city of luck with its fascinating fountains, draws 90 percent of its water from Lake Mead. The largest reservoir in the United States is fed by the Colorado River. The areas around Las Vegas, however, are taking more from the lake than flows into it as snow melt and rain water from the Rocky Mountains. During the 14 years of drought, the water level has dropped by 35 metres. The two existing water intakes for the Las Vegas Valley are in danger of running dry, and Intake No.1 could be at risk next year. It is now only 24 feet (7 metres) below the lake level. Arup, a multidisciplinary engineering and consulting firm with a reputation for delivering innovative and sustainable designs, has announced that the Billy Bishop Toronto City Airport Pedestrian Tunnel project has won the Tunnelling Association of Canada (TAC) 2014 Canadian Project Award. A ceremony was held at the Sheraton Wall Centre in Vancouver on Monday evening, October 27th. Morgan Advanced Materials has made available FireMaster FireBarrier 135 sprayed refractory cement, offering superior fire protection and simple, cost-effective installation. FireMaster FireBarrier 135 is ideal for concrete tunnel lining fire protection, and the fire protection of ventilation shafts, escape tunnels and refuges as well as critical systems such as water mains and communication cables.